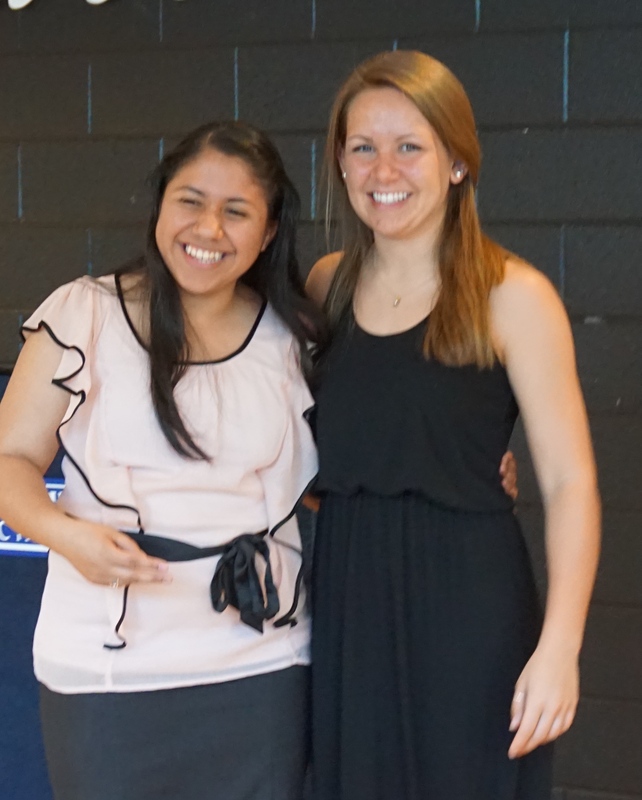 Laura Patrick is a JMU student and college mentor for Kenia, and SV-SLI Scholar at Harrisonburg High School. Read more about Laura and her relationship with Kenia. Laura comes from a small town in southeastern Virginia. She is an undergraduate scholar of James Madison University’s Centennial Scholars Program, as well as a member of InterVarsity, a Christian Fellowship on that campus. She has also been a youth group volunteer for almost a year and a half at First Presbyterian Church in downtown Harrisonburg. Laura is majoring in Interdisciplinary Liberal Studies (IDLS), with double minors in Elementary Education and Non-teaching Special Education. She learned about SVSLI while working with Dr. Carlos Aleman at an after-school practicum during her freshman year. She became SLI college student mentor for during her sophomore year. Kenia, her high school partner, was also a sophomore. Laura describes Kenia as wonderful, hardworking, and determined. She says Kenia has the sweetest, most genuine heart. In addition to going to high school, Kenia has a job and is dual-enrolled in courses at Blue Ride Community College. Activities that Laura and Kenia do together include going to Sweet Bee frozen yogurt, El Sol (a restaurant downtown that Kenia considers to have genuine cuisine), and performing community service at Thomas Harrison Middle School. Since meeting, Laura has noticed many changes in Kenia, but the largest is her increase in confidence. Laura says that Kenia has also grown in her ability to communicate with other people and better articulate her thoughts and feelings. She says that Kenia is now more willing to engage and open up with her and with the other kids in the group. Something that Laura loves about Kenia is that she is still discovering her passions. Laura finds it refreshing to be around someone like Kenia who is so full of life and hope. While talking with Laura, it was clear to see the impact that being an SV-SLI mentor has had on her. She considers herself to fit the typical mold of a JMU student and this program has helped her go beyond the “JMU bubble.” Working with Kenia and SVSLI, Laura has realized that “People aren’t colorblind and shouldn’t be. We should embrace diversity.”Laura loves learning about each individual person in SLI and has realized that “Latino” does not mean just one culture, but is instead comprised of many cultures. This summer, Laura plans on working at Refuel Summer Day Camp in Philadelphia, which she describes as a Philadelphia Project mission organization that focuses on aiding the community and racial reconciliation. She says SVSLI has helped her prepare for this next step in her life journey. This entry was posted in Uncategorized and tagged Challenges, communication, Education Access, Harrisonburg, JMU, latino, Leadership, Philadelphia, SLI, Strength. Bookmark the permalink.